How do you juggle the various tasks of traditional cooking day in and day out without going crazy, without turning to non-real food, and even while getting a good night's sleep? 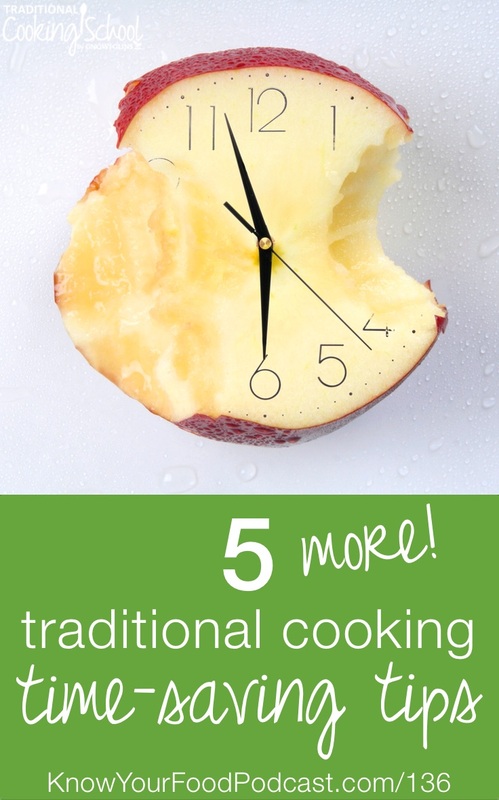 Of course I want to hear your answers… and in this podcast, I'm sharing five more of my own time-saving traditional cooking tips. These are the exact same tips I follow, along with my family, to keep sane, healthy, happy, and rested. Please share your time-saving tips in the comments! I plan to do this for many podcasts in the future. Follow @TradCookSchool on the Periscope app or http://Periscope.tv/TradCookSchool on Thursdays if you want to join the fun! Listen to the podcast or watch the video above for the full version of these tips! Tip #1: Use your crockpot! The crockpot can really save you time! Soups, stews, roasts, meats that benefit from long cooking. So much can be cooked hands-free in the crockpot. Prep extra when you’re doing it. Need an onion, dice two (but plan to use it soon). Soaking a jar of nuts? Soak two (or three). Your effort goes twice as far. Cook a big pot of rice, and use it in meals for four days instead of two. Children and other family members can be a big help! For example, young children can be taught to rinse sprouts. My son rinses and starts sprouts, while my job is to oversee and make sure the sprouts are not spoiling, to store the sprouts when done, and to direct him to get seeds soaking. Children can also get oatmeal soaking or muffin batter soaking. My children load and unload dishwasher, wash dishes by hand, put away dishes, soak sprouts, cook simple dishes. Everything they can do frees me up to do other things. Anything they can do for you will free you up to do more complicated things. Tip #4: Assemble packed lunch while you're assembling dinner. Whatever is going in tomorrow's packed lunch for your husband or children, fix it while doing dinner. For instance, the salad or sandwiches. Or, set aside portions of the main dish and side dish for easy warming in the morning before filling a food jar. Tip #5: Perpetual stock pot. Use a crockpot for stock. Keep it on low all the time. Replace water every time you take stock out. Replace the bones every three to five days. You can check to see if it is still gelling by taking some out and chilling it. I don't often do this but more often go by flavor — when it starts reducing in flavor, it is time to switch the bones out. Of course, you'll want to wash the crockpot every once in awhile — you get the idea! This will save you time, and also — more importantly, perhaps — give you ready-to-use stock to boost the nutrition in countless dishes and meals! I’m the oatmeal eater in my family of 2. I always soak and cook enough oatmeal for breakfast for 3 or 4 days. I add the cinnamon, raisins and maple syrup when I cook it and then after I enjoy the first piping hot serving, put the rest in a container in the fridge. I reheat the other servings in a pyrex bowl in my toaster oven or, especially in the summer, I enjoy it cold like rice pudding. When I finish the last serving I try to remember to soak more oatmeal by placing it in a covered pyrex casserole dish in the back of the oven with the light on. The light provides just enough warmth and reminds me that I have oatmeal soaking in there. Such a great tip, Beth. 🙂 I’m including it in podcast #138 that will be out on Nov 20th. Thanks so much!